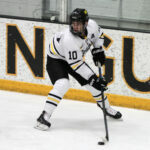 The Gustavus men’s hockey team Saturday lost 1-0 at Concordia, dropping to 7-15-1 overall and 4-9-1 in the MIAC. 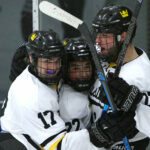 The Gustavus men's hockey team Friday lost a gut-wrenching 4-3 overtime decision at Concordia. The sudden death game-winning goal came on a two-on-one breakaway with just four seconds left on the clock. After enjoying a weekend off, the Gustavus men’s hockey team is back to action this weekend with an away series at Concordia. Friday’s game starts at 7 p.m. and Saturday’s contest is at 2 p.m. - both at the Moorhead Youth Rink. The Gusties enter the series 7-13-1 overall and 4-7-1 in the MIAC, while the Cobbers are 11-7-3 overall and 7-3-2 in the league. The Gustavus men’s hockey team put Saturday night’s game away late with three third period goals against Saint Mary’s en route to a 5-1 victory at Don Robert Ice Rink. The Gusties salvage a series split, moving to 7-13-1 overall and 4-7-1 in the MIAC, regaining the league’s fifth spot in the standings over the Cardinals with 13 points. 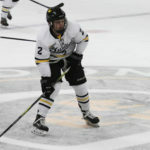 The Gustavus men’s hockey team suffered a 2-0 setback Friday at Saint Mary’s, dropping to 6-13-1 overall and 3-7-1 in the MIAC. 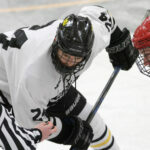 The Gustavus men's hockey team is set to take on Saint Mary's this weekend in a home-home series. Friday's game in Winona, Minn. begins at 7 p.m. and Saturday's game at Don Roberts Ice Rink starts at 7:05 p.m. 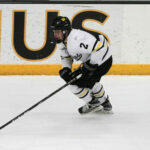 The Gustavus men’s hockey team Saturday handed Augsburg – the No. 4-ranked team in the nation – its first MIAC loss of the season in a 3-1 decision at Don Roberts Ice Rink. The victory snaps a six-game losing streak as the Gusties improve to 6-12-1 overall and 3-6-1 in the MIAC, while the Auggies drop to 14-3-2 overall and 8-1-1 in the league. 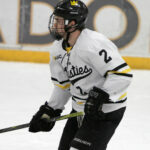 The Gustavus men’s hockey team suffered a 4-2 loss at No. 4-ranked Augsburg on Friday night. The Auggies jumped out to a 3-0 lead in the first period and the Gusties were unable to dig out of the hole, dropping to 5-12-1 overall and 2-6-1 in the MIAC. The Gustavus men's hockey team continues conference play this weekend against No. 4-ranked Augsburg. Friday's game in Minneapolis begins at 7 p.m. and Saturday's game at Don Robert Ice Rink is at 7:05 p.m. 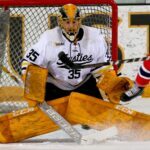 The Gustavus men’s hockey team lost 3-1 at St. Thomas on Saturday night, dropping to 5-11-1 overall and 2-5-1 in the MIAC.